My DK, who happens to be my JC wracked up all of the most useful gem cuts during Wrath. Like many people, since Cataclysm hit I've been solely focusing on the market of Cata gems, and my Wrath recipes have been sitting idly. I recently came across a stack of raw Majestic Zircon for 80g a pop. I cut these into Solid Majestic Zircon (Stamina) and was able to sell every last one for 215g each. After AH fees, thats about an 125 gold Profit per gem!! 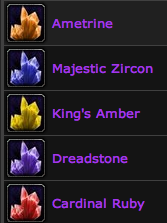 My tip of the day is use Auctionator to set up a list of Wrath raw gems, and keep an eye out for when they're cheap. Whether they're rare or epic, usually there's a nice enough profit margin to justify the time put in. Another alternative is watching for the mats for Icy Prism, which no longer has a cooldown, to get your Wrath gems. If you don't pay too much for the Frozen orb (the most I'll pay is 20 g) the green gems that go along with it in this recipe are usually 1-2 g on my server, which results in some nice profits on the gems made, even if they don't proc an epic! Personally I would only get 5 cuts (in my experience Wrath green gems don't sell well, I just sell them raw for leveling JC's). For Red i would go with Brilliant for all the leveling casters, Purple I'd go with a Purified cut for the healers, Yellow I would go with a Quick cut, but this one could go a few ways, do some research on your server particularly, for Orange I would suggest a Reckless cut, and of course for Blue go with Solid, leveling tanks love stamina. The only problem is if your JC doesn't have a cut, you will have to go to Dalaran to do some Dalaran JC dailies, but I'd even suggest making your JC's hearth there, because since 4.1 the portals to Orgrimmar and Stormwind are back in Dalaran. The turnover rate isn't as high, but the rares and epics both sell at a pretty good profit margin for that extra gold making edge in what may be a niche market on your server! For my first official post, I decided to do a piece on the add-ons I use to make gold, because add-ons are in my opinion essential for streamlining the process. I realized that some of the add-ons need way more explaining than others, so the ones that I wrote individual articles on are linked to the name of the add-on, if you're interested, click it for more info, including setup and use. 1) Auctionator - Simple interface add-on, good for batch posting auctions, and allows you to make lists of commonly searched for items. Also records the last scanned price for all items in the AH as a tool tip for when you're away from AH. Click the link for a more detailed explanation. 1) Gathermate2 - This add-on is perfect for your gathering alts. You need to download a second package called Gathermate2_data. 1) Postal - This is an add-on that will get all of your mail in your mailbox for you, by clicking a button. I've tried at least 5 of these, and Postal is by far my favorite. Besides getting your mail it remembers the names of your alts and will keep a name in the box, which is convenient for mailing mats/gold between alts. 2) Accountant - This add-on keeps track of you gold inflow and outflow, and is great so you can see the big picture of your selling. Keeps track per character or overall, and has time frames of 1 session, 1 day, 1 week, or since you DLed the add-on. More in the guide. 3) Scrap - This add-on sells your junk (greys and things you can specifically specify). When you first log in after Downloading it, it will start a tutorial which will explain its functions completely.